Hey man, great preset! I really do love it. I'm wondering, have you thought of creating a BTT Button to launch the Messages app, similar to how you created the Notes and Finder ones? I would LOVE to see that! Hey there! I'm really enjoying your preset, but the play/pause button isn't working for me. Any ideas why? When I tap the Spotify song name, it switches to the next song just fine. Hey there! Are you on the latest version? I tried downloading the Minimalist preset and the play/pause works fine on my end. Perhaps the new update (coming soon) can fix that! Yea, I'm on the latest version. 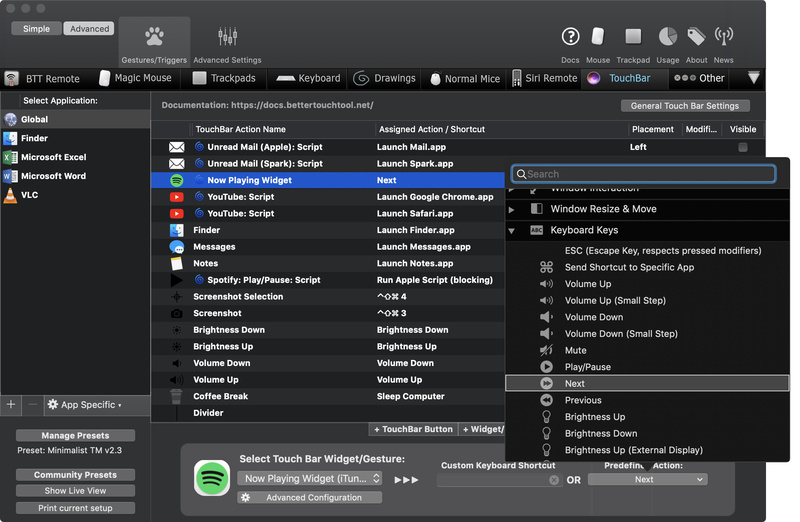 When I play/pause on Spotify, the icon changes as well, but pressing pause on the Touch Bar doesn't react. It doesn't launch Spotify either. It's no biggie, I can wait for the next update. when I press and hold the Option key, the macOS System Preferences are opened and closed. Cmd + Z (undo) does not work when this preset is running. Hi there, this has got to do with the True Tone toggle icon. 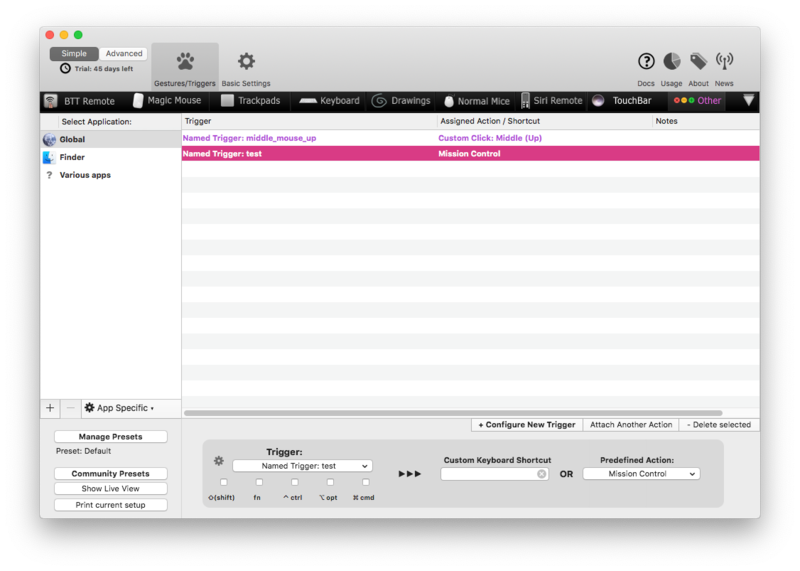 I will be removing this feature on v2.3 since it constantly triggers System Prefs. But when the community finds a way to fix the True Tone toggle issue, I will update the preset again. New version v2.3 is out!! Hopefully this version addresses some of the problems you guys are facing! And I've also added support and stablised certain features such as True Tone. Do let me know if there's anything you want to know, thanks again for the support! Hi tmxgkh : great job thank you, it helps me very much. How do you get macOs 's icons like volume down or mute ? I didn't find then on the net. Thanks for any help. Hey, love the preset it's definitely my favorite, even over what I've created personally. I can't get the gesture controls to work, though. I removed the 4 finger gestures, and changed the 2 finger gestures to keyboard illumination. None of the gestures work though (3 and 2 finger). Any suggestions? Great to know you're loving it! Hi tmxgkh this is exactly what I was looking for : thank you very much ! First of all - thank you very much for the preset, for me it's the best base I've found here. Or maybe anybody is able to help me out? Hey @Ro_your_bro, I'm not exactly sure if this is what you mean. 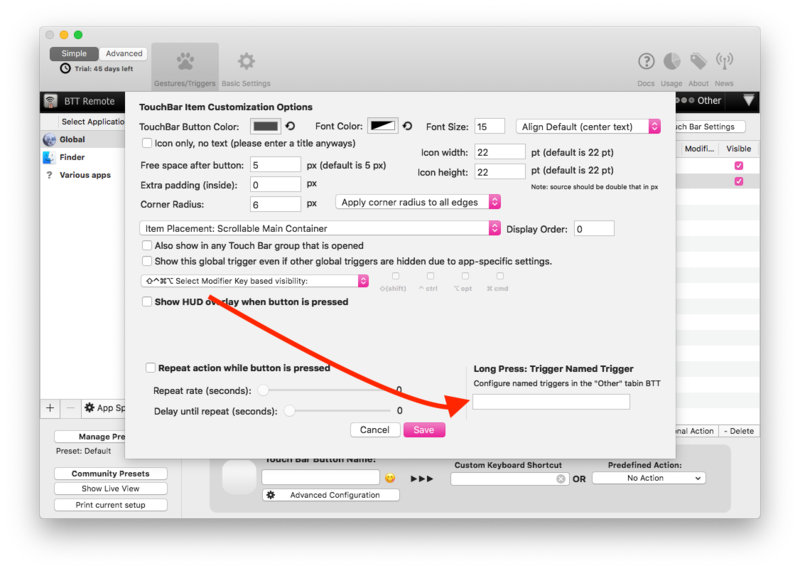 But you could try switching the Predefined Action to Next. See if this solves your issue, and let me know! 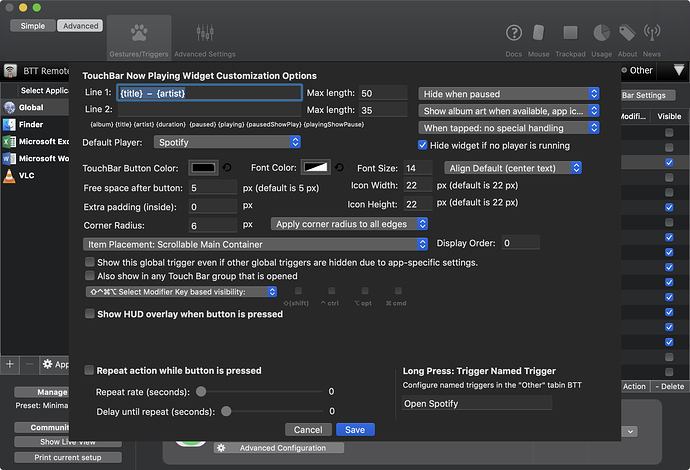 Yes, bro, that's exactly what I need (turned out to be so simple, lol), BUT, I need "Play/pause" button as well. So, perfectly, it would be like if a long tap runs "Next" button and a simple tap runs "Play/pause" as it is now. Is there a chance to code something like this?